At Dr. Taylor’s Family Dental Center, our primary goal is to help our patients achieve a lifetime of good oral health. However, oral health is more than just the appearance of your teeth, it is also about the feel and function of your whole mouth including gums, soft and hard oral tissues, as well as the nerves inside your teeth. As one of the most trusted dental practices in Waterford, we are proud to offer our patients a wide range of restorative dentistry procedures. Restorative dentistry involves the diagnosis, prevention, and treatment of oral disease. Think of it as like general and cosmetic dentistry combined. Restorative dentistry does not only fix the look and function of your teeth, it also provides preventative measures to keep your teeth and mouth healthy. If you have lost all of your teeth, but are uncomfortable with traditional dentures, you may want to look into getting implant dentures. Unlike the traditional dentures, an implant denture does not merely rest on the gums but is attached to either a bar-retained or ball-retained implant. 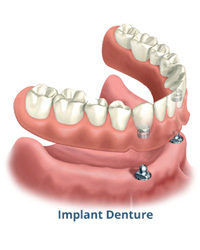 Implant dentures are also more stable, making eating and talking easier for patients. For patients who have just one or a few missing teeth, we recommend dental bridges. Dental bridges literally bridge the gap made by missing teeth. Depending on how many teeth you have lost, one or more artificial teeth are placed in the gap, which is then supported on each side by your existing teeth. Dental bridges are natural looking and very durable. In fact, it can even last a lifetime with proper care and oral hygiene. More than an actual crown, dental crowns are designed to function like a cap to restore a tooth’s shape, size, strength, and appearance. One of the most common restorative dentistry procedures we have in our Waterford dental practice is dental implants. Dental implants are probably the next best thing to natural teeth. Patients who are looking for a permanent solution to their missing teeth can greatly benefit from dental implants. This procedure can also be performed to ensure that your dentures, crowns, and bridges are more stable. Our restorative dentists can provide you with a thorough assessment of the condition of your bone structure to determine if you are a good candidate for dental implants. If you are looking for a more affordable solution to missing teeth, dentures remain to be one of the best options in the field. Dentures are made to resemble your natural teeth so no one would even have to know that you’re wearing one. Whether you need partial or full dentures, our Waterford dentists can ensure a durable and comfortable set of artificial teeth for you. Root canal or endodontic therapy is a necessary restorative dental procedure to help stop the infection inside the tooth. When a tooth decay or cavity is neglected, the bacteria can penetrate all the way to the pulp and cause damage to the nerve of the tooth. A patient may experience severe pain when the pulp has an infection. Root canal therapy is then performed to help alleviate the pain and avoid tooth extraction. As a seasoned dental practice, we know that root canal therapy, unfortunately, has a negative reputation. However, many of our past patients were surprised that they feel little to no pain at all while undergoing this restorative dentistry procedure. Rest assured that we’ll strive to do the same for you. We even offer a free nitrous oxide to help you relax or sedative dentistry to ensure a completely pain-free procedure. At Dr. Taylor’s Family Dental Center, we put emphasis on good oral hygiene and preventative care to prevent tooth loss. While we can assure you that we will use every measure possible to keep your pearly whites intact, there are times when extracting a tooth is necessary. Whether your tooth has been severely damaged or your mouth is suffering from overcrowding, our Waterford dentists are committed to making sure that our tooth extractions will be as pain-free as possible. Do you need any restorative dental procedure? Get started by calling our office at (248) 681-8100 and scheduling a consultation.